As mentioned earlier, the neo L looks very similar to the Neo and Neo V in terms of design. But this time round, the device has a 4-inch display that also makes it heavier at 131.5gms. The phone is bulky in its build but is solid. The device comes in black and white colour options. The smartphone has a glossy finish, which makes the phone a rather slippery customer. The screen is a fingerprint magnet as well. There's a silver strip that runs along the edges of the phone separating the front and the back. The device features 4 physical buttons, that feel a bit too squeezed and difficult to operate. One wonders if capacitive touch buttons would have been a better choice. The power/wake button is placed on the right along with the volume rocker. The placement of both these buttons isn't convenient though. If you're holding the device in one hand, you find stretching your thumb quite a bit before you get to them, especially if you have small hands. The 3.5mm headphones jack finds room on the top while the Micro-USB port for charging and data transfer is located on the left. The back of the device houses a 5MP shooter with LED flash, adjacent to the grilled speakers. 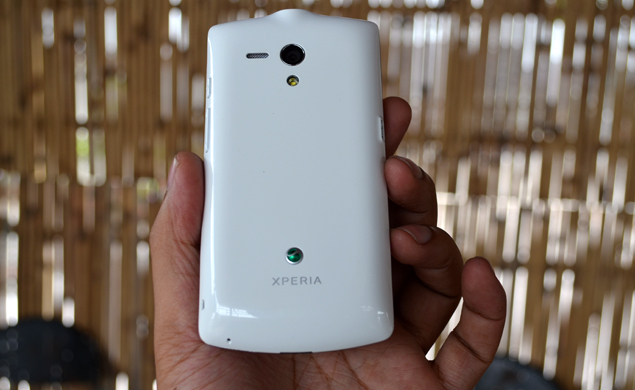 Beneath the skin, the Xperia neo L features a 1500mAh battery, a SIM card slot and a microSD card slot. Overall, the neo L does have an attractive design but certain improvements would have been welcome. The Xperia neo L comes with a 4-inch LED-backlit capacitive touch display. Images look crisp at 480x854 pixels. The viewing angles are good. But at maximum brightness levels, the phone disappoints. It's hard to view screen elements in broad daylight. Images on the HTC One V look better, thanks to the ImageSense technology. Even under low lighting conditions images look good. The Optimus L7, on the other hand, features an IPS-LCD NOVA display and also has better viewing angles displaying images that are vivid and bright. But again, images under the sun look dim even with 100% brightness levels. The Xperia neo L comes with a 5MP rear camera. Outdoor shots are decent. Images appear sharp with good colour and contrast and are an improvement over the Neo V. There are some flaws. There is no option to zoom and the auto focus just doesn't work. So if you're trying to take wide shots, it seems like an impossible task. The absence of a touch-to-focus is also felt. The Neo V had better auto focus capabailities. The phone also lacks a dedicated camera button. Other camera settings are pretty basic including scene mode, exposure levels, white balance and flash. Users can share pictures instantly to various social media like Facebook, Twitter, Picasa, Google+ and more. 720p video recording is possible at 30fps and videos recorded are saved as MP4 files by default. Users can also choose to shoot in SD mode. The video recorder features continuous auto-focus, though it may take some seconds to refocus while re-framing. There's a front camera for video calling. Coming to the camera software, the device has the stock Android interface. But Sony's custom camera offers better options like Touch Focus for instance. But the user won't complain much as it offers all the basic camera features. The smartphone ships with Android 4.0 (Ice Cream Sandwich) on-board, that makes it a first of its kind from Sony. Sony's familiar Timescape UI manages all your communications ranging from Facebook and Twitter to Contacts and Calls under one roof. Timescape focusses more on the social networking integration. Certain ICS tweaks are visible instatntly. The lock screen earlier featured an unlock slider and one for silent mode. Th latter has been replaced by a camera slider. 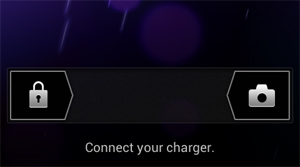 Another noticeable change is that the notifications menu is no onger accessible from the lockscreen. This does come by as a bit surprising since it is a prominent ICS feature. 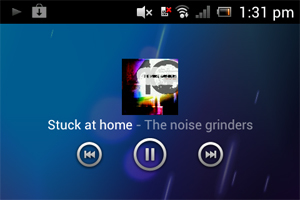 An addition is the ability to control music playback from the lockscreen, that displays the music player widget. Apps can now be arranged in various ways such as Alphabetical, Most Used, Own Order and Recently Installed. Since the capacitive touch buttons are replaced by the physical ones, aplications current running can be closed by long-pressing the home button. A new feature is Overview, that provides the pinch-to-zoom functionality. All active widgets float on the screen for easy viewing and selection. The mediascape widget is no longer available, but the standard gallery is back, in addition to the Xperia gallery. The music player on the device missed the ICS update. It still houses the old music player that featured before the NXT series. The main menu offers browsing in four tabs for the available sorting options: Artists, Albums, Tracks and Playlists. There is no dedicated video player on the device. However, users can download video player apps from Google Play. Other custom skins like Samsung's TouchWiz UI provide greater functionality by adding buttons to the notification bar that allow Wi-Fi, Bluetooth, GPS and rotation capabilities to quickly be turned on or off. It also has the ability to silence the phone. The device features a 1GHz Qualcomm processor and 512MB RAM. The user interface is slick and works pretty smooth most of the time. But we'd suggest the use of a Task Manager as the device isn't the best at multitasking. Compared to other Xperia devices, the neo L does score some extra points for a big 4-inch screen. Watching videos, keeping widgets or app shortcuts on the screen is an advantage. Apart from the usual stock of Google apps, the smartphone comes pre-installed with apps like OfficeSuite, McAfee Security and NeoReader that helps you read bar codes. Casual gamers will be excited to see the EA Games app that offers free games like Plants vs Zombies, Dead Space and Tiger Woods PGA Tour 12 in trial mode. But the key highlight is Need For Speed Shift (Google Play lists NFS Shift for Rs. 273!) as a full free game to play.